Wind energy has been used for centuries to pump water, process farm products and power industrial applications. In modern times, wind turbines are most often used to generate electricity for export to the electricity grid. Wind is an attractive fuel source for many reasons; it’s renewable, it’s abundant, it produces no greenhouse gas emissions or other toxic emissions, the fuel is free, and as the global installed wind turbine capacity continues to accelerate, it’s becoming increasingly more cost-effective. In fact, the levelized cost of energy (LCOE) for new utility-scale wind turbines in the U.S. is currently projected to be on par with carbon-intensive sources like natural gas but the intermittency of wind currently limits the amount of wind energy that a conventional grid can support (1). However, as capacity increases and the technology matures, this can be mitigated through the averaging effects of many installations, improvements in prediction algorithms and even someday, utility-scale storage. Small-scale wind turbines are typically much less cost-effective than their utility-scale counterparts but do have important niche applications, especially in remote or northern off-grid locations and microgrids. 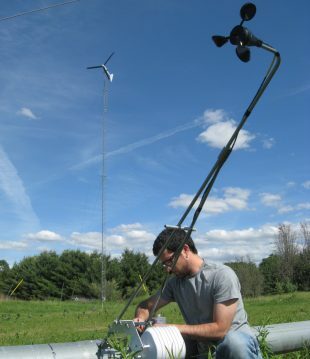 The Living City Campus is home to Ontario’s only small-scale wind turbine test site. While the site is equipped with the infrastructure and instrumentation to analyze wind turbines according to the IEC 61400 standard, the key research at the facility goes beyond wind turbine performance characterization and is increasingly focused on the incorporation of wind turbines into a smart microgrid environment. In this context, small-scale wind turbines are an important complimentary power source to solar photovoltaics that can help to promote a more resilient and robust microgrid.